What does the spring mean to you? To me, it means writing reatreat and research trip. I figure, if I have to drive 4 hours to get to the retreat, I may as well turn it into a research trip while I'm there. It worked well last year. Throughout the winter, I planned my route, figuring out what I needed to see for my current writing projects. 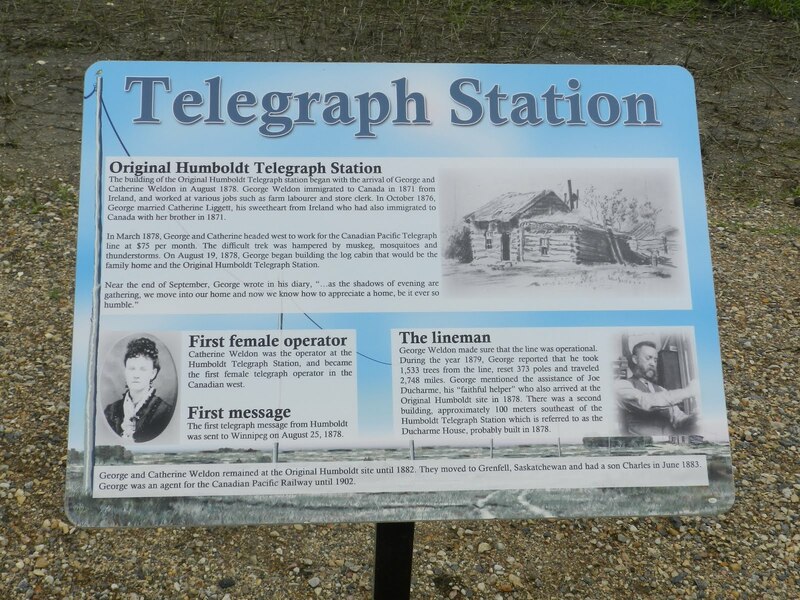 The Trails of 1885 is a tourist designation for the Riel Rebellion - Canada's only civil war. It happened in 1885 when Louis Riel lead the uprising of the Metis against the Canadian government for not acknowledging their concerns. The Metis are the descendents of the Coureur de bois - those brave Frenchmen who paddled the explorers' and map-maker's canoes into Rupert's Land leading the way for the fur traders, missionaries, and settlers. Far from home, the Frenchmen married Native women and stayed to become trappers, fur traders, and settlers themselves. The Metis way of life was distinct in Canada since it followed the ways of France. One of the biggest differences being that their land lay in strips where each farmer would have a small amount of river frontage and his land would go back, away from the river. The Canadian government sent surveyors to divide the land into squares, the English way of doing it. The Metis expressed their oppostition. The government ignored the Metis concerns. And in 1885, the Metis rebelled with the final stand-off at Batoche where the rectory still bears the holes of the Gatling gun. 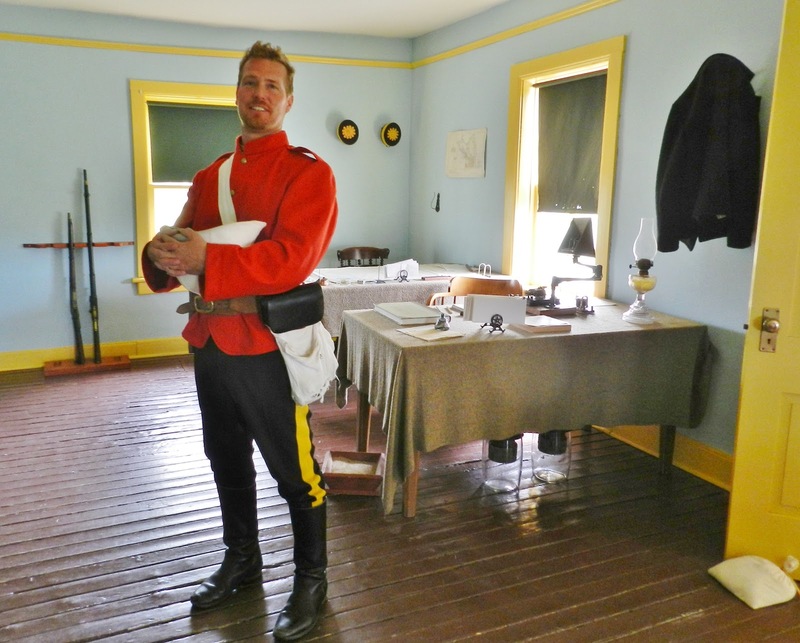 Last year, the writing retreat was the week before Victoria day and only Batoche was open for the season. Canadians celebrate the current monarch's birthday on Victoria Day which is the unofficial weekend for the start of the summer season. This year, the retreat was in June so I was sure everything would be open. 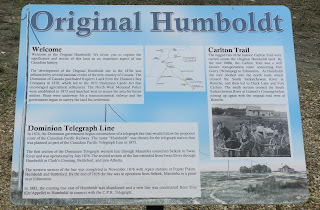 Since the retreat was at St. Peter's College in Muenster, my first stop was just west of there at Humboldt where I wanted to see the progress of the archaelogical dig of the original Humboldt Telegraph site. 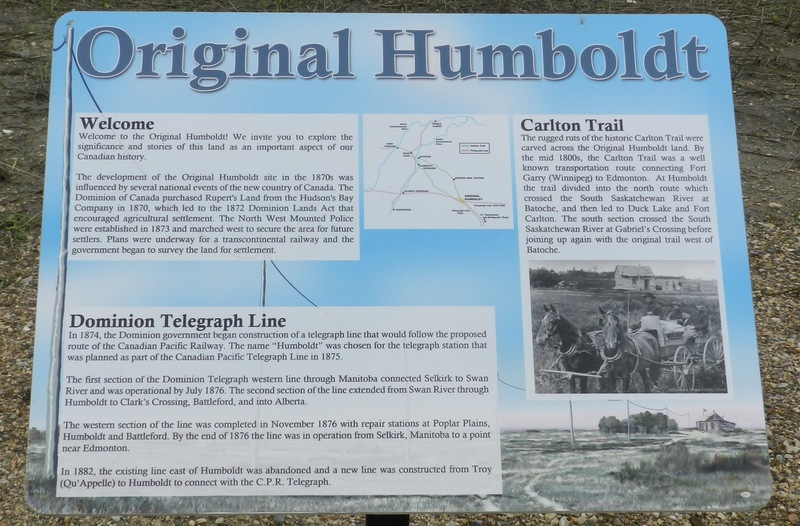 The Humboldt Telegraph Station is important to me because of its location on the Carlton Trail which plays a large part in my Mountie story. I'm also energized that the first operator was a woman. And that brings up yesterday's post by Suzie Johnson about Women Making An Impact In The Lives Of Others. Back to my research trip, I was very surprised and pleased with what I saw there. If you're interested, read my blogpost, The Union Jack Flies On A Dry Run. From that success, I travelled west, around the perimeter of Saskatchewan's biggest city of Saskatoon, and down to the southeast side. 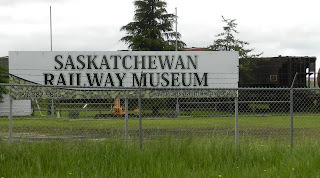 My goal was the Saskatchewan Railway Museum. I checked the website before leaving and saw that it was open from Victoria Day to Labour Day, so I was all set. Unfortunately, I missed the part that said it was only open on weekends and holidays. How can a tourist attraction be closed on weekdays throughout the summer? I was so despondent. 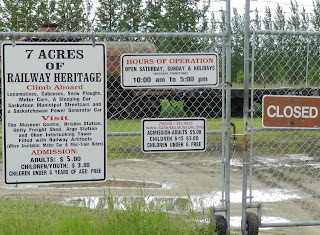 I read and re-read the list of things to see on the 7 acres of railway heritage on the other side of the fence, hoping someone would come out and take pity on me. After ten minutes, I realized that whoever owned the cars inside the fence wouldn't be coming to see who was outside the fence. Not only that, but when I looked at the website on my iPhone, I realized their Railway Heritage Day had been the day before. If I'd left the writing retreat one day early, I would have been there for the railway museum's special day where they fire up things you don't see or hear otherwise. I drove to the southern edge of Saskatoon to the Western Development Museum (WDM) where there was a real sod house on display. Yet foreboding grabbed me as I looked at the empty parking lot. No, it couldn't be. I got out of my van and walked to the dark entrance where a man with a backpack was reading the sign. As I approached, he said in what sounded like a German accent, "It's closed on Monday." What? There are 4 WDM's in Saskatchewan. I used to live in Moose Jaw, so visited their WDM regularly. I researched the WDM in North Battleford last year. This was WDM Saskatoon's turn. I thought the WDM's were always open throughout the year except for major holidays. Yet as I read the sign, I saw that he was right. When I mentioned it to someone later, they said, "Budget cuts." Sigh. Back on the road, I headed for Wilkie where the museum was made up of 5 buildings including a printing press operation which is what I wanted to see. Apparently, in the 1960's, the press owners left everything intact, gave the key to the museum board, and walked away. The equipment inside was supposedly all the way back to 1910 era when the business began. I was very eager to see this operation. I arrived in Wilkie around 6 pm. Spotting a motel, I booked a room for the night and started up the east side looking for the museum. By the time I got to the gas station on the other end of town, kitty-corner, I hadn't found the museum, nor a sign about it. The station attendant said it was "somewhere in the middle of town". So I went back, driving along the western edge this time. Not one sign pointing the way to the museum. So, I started going up and down the streets. When I saw 2 women loading a vehicle, I stopped and asked them. Blessed be, they were both members of Museum board! With her van loaded, one woman said to follow her and I soon found the main museum in the old fire house. The sign out front said who to call for appointments. I made the appointment for the next morning and went back to the motel. The next morning, a very knowledgable man, Ed Elder, gave me a tour of The Wilkie Press and allowed me to take lots of video of him explaining the operation. This tour alone was worth the trip and made up for the disappointments of the day before. In case you're wondering, the Saskatchewan Railway Museum, the WDM, nor Wilkie are part of the Trails of 1885, but since I was in the area, it seemed like a good idea to check them out. 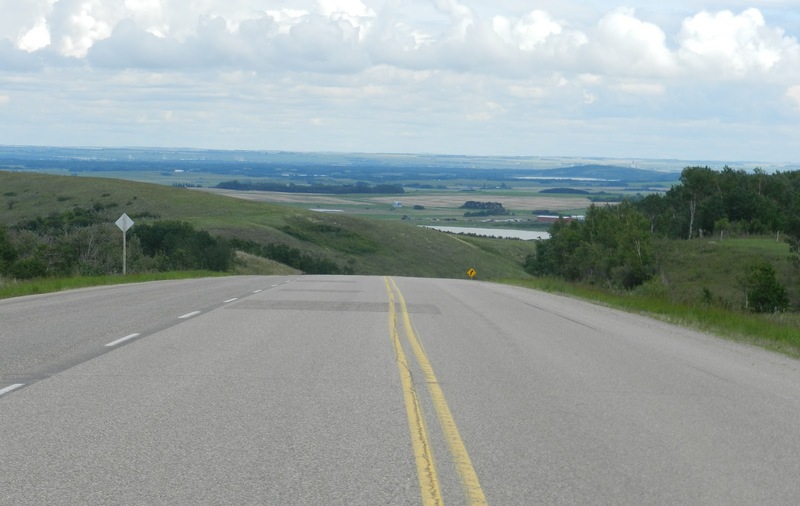 Heading north from Wilkie, it wasn't even 30 minutes before I stood looking down at one of the numerous Valleys of the Saskatchewan River area. And if it looks like I'm standing in the middle of the road, I am. Traffic was almost non-existent that midday. 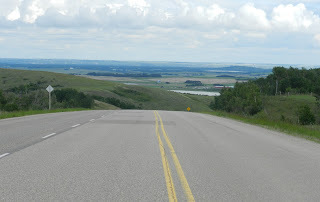 I crossed the Battle River Valley and up the hill to Fort Battleford. Along the way, I stopped to pay my respects at the NWMP cemetary. 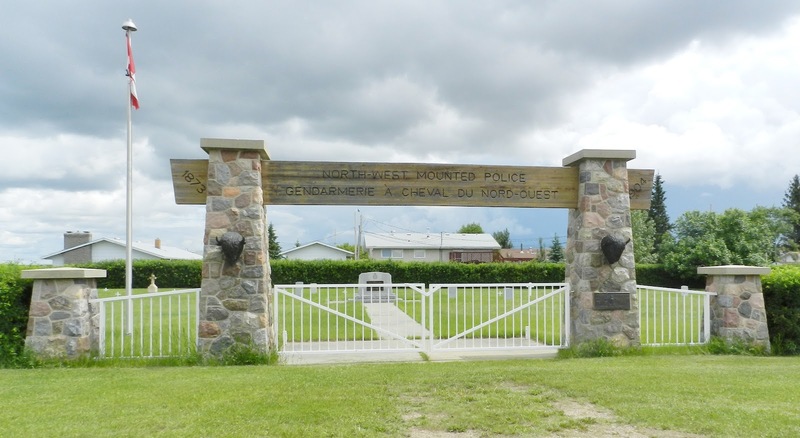 The plaque on the front reads, "In honour of those members who served in the North-West Mounted Police during the development and settlement of the Canadian West." The plaque on the monument lists the names of 6 Mounties buried in unmarked graves. I really wish they hadn't allowed homes to be built so close. It just jars somehow. 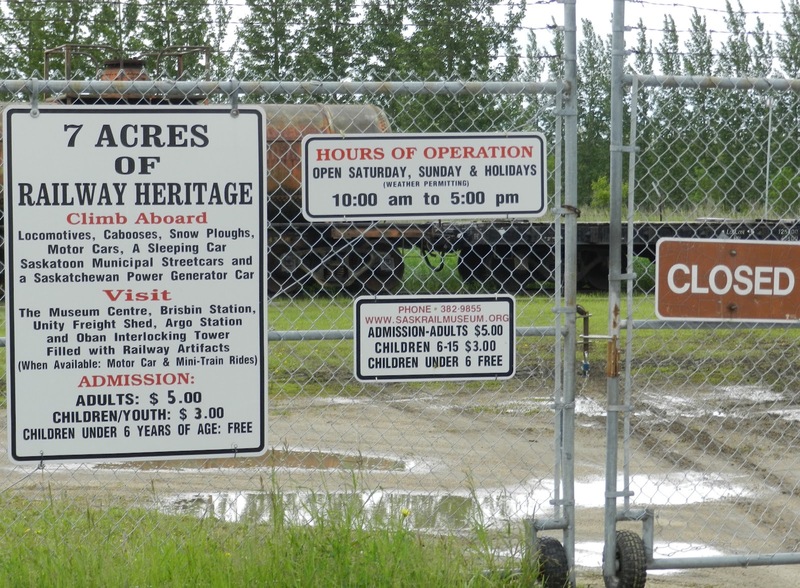 Last year, Fort Battleford was closed when I arrived, but I made a phone call and was allowed inside. I couldn't take any photos of the employees because they weren't in official period costumes yet, although they were practising their roles. However, one Park employee gave me a personal and very knowledgable tour. This year, three school buses were in the parking lot when I arrived so I knew the fort was open. Sure enough, a Mountie wearing the white pith helmet and red serge tunic led the way to the fort. Since I wanted lots of period photos, I allowed them to go ahead and toured the Men's Barracks first, which are situated outside the fort walls. After the Men's Barracks, I followed the path into the fort and was met by a Sergeant in brown undress uniform who offered to show me around. He was nice, but I was hoping to find a Mountie in red serge wearing corporal's stripes to match the hero of my Mountie story. And then there I was in the Orderly Room when a man in that exact uniform walked in. I quickly asked if I could take his photo. Imagine my surprise when he said I was there last year and announced, "You're the writer." Yup, that's me. And he was the employee who'd shown me around last year. 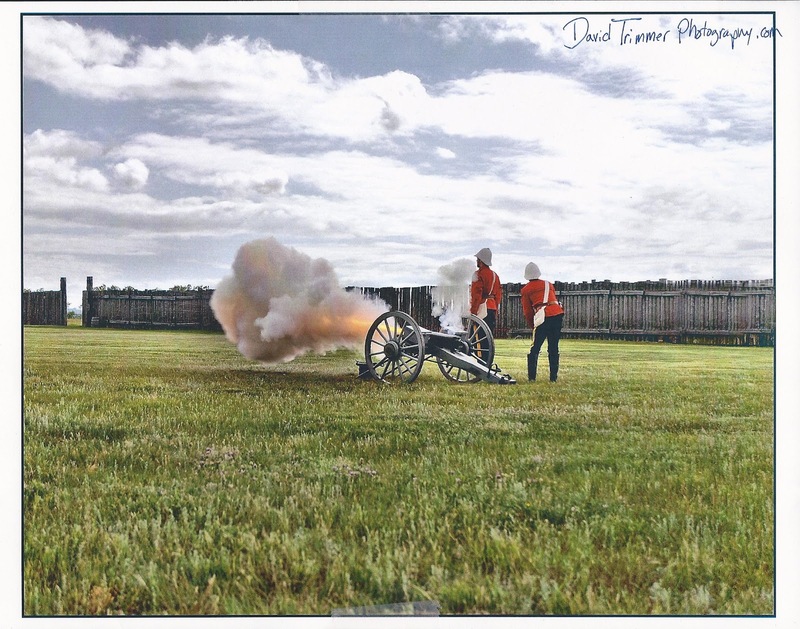 He's David Trimmer, a photographer by trade, and someone who loves history. I have many photos and several videos of David giving out information about Fort Battleford, gleaned as we toured the rest of the site. A hint... if anyone needs photos of Fort Battleford, the NWMP, horses, ranch-life, or anything along those lines, check with david at www.davidtrimmerphotography.com first. He may already have what you need, or he can get it for you. I still have one day left of my research trip, but this post is very long already, so I'll sign off for now. I'll leave you with the video I filmed while they fired the cannon off at Fort Battleford. 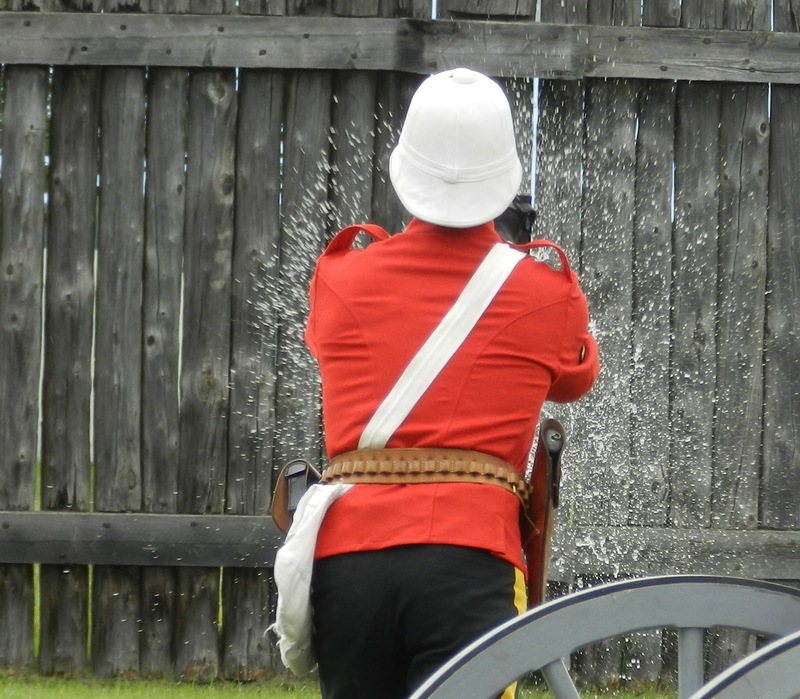 In the video, David is the Mountie on the left - the powder monkey, as you'll find out. And when the job is done, the powder monkey must clean up his mess. Which part about my trip enthused you so far? Which part did you want to learn more about? have been following your research posts. i can feel the disappointmet of those closed places for research (bummer). i think i like the Fort stuff best, perhaps because David is such a handsome man and he remembered you. How cool is that? Especially since he calls you the Writer. Perhaps the next time you see him, you'll be the PUBBED writer *heh*. Hey Deb, speaking of North Dakota, I'm finally heading down next week. 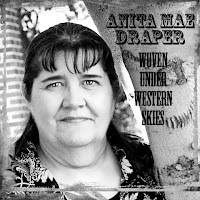 I have so many giveaways I was supposed to send to readers of my Author Memories blog, but between the mucky roads and writing deadlines couldn't make it. I was going to go this week, but a super nice Inky is sending me a copy of her latest book, so I'll wait on that and head down next week. JJ will be out of school, so he can come and help carry all the mail. I'm so glad you like my research posts because I enjoy taking the trips and then posting about them. I enjoy the Saskatchewan museums that I've seen too -- and I've been to some of the ones you've mentioned. When's your next trip to visit the ones that were closed? Anita, I love that you have time set aside to take a research trip every year! I'm going to put that down on my list of writing goals, because I've found if I don't plan it, it doesn't happen! I probably won't head up that way again until next spring as I'm headed to LA at the end of July, Ontario the end of Aug, and Dallas in Sept. Plus, I have to fit a trip to Winnipeg in there somewhere for a ride on their 19th century locomotive, although I should probably work that into my trip to Ontario. It depends if the family comes with me. Getting back to Saskatoon, I keep thinking they're going to fix that Lorne St area around Early's and the WDM, because it always seems like it's in a state of disrepair. You'd think they'd want to show off that area to tourists with such a huge history museum there. You're right about booking the time. I never took research trips until I started going on the retreats. Now I go on them at other times, too and often take JJ with me, like our foray into Fort Walsh and Calgary Heritage Park last summer. It's like going to see Theatre on the Hoof this weekend. As soon as I heard about it, I told the family I was going and invited them to come along. It's Canada Day on Sunday, so it's a perfect day to spend with the family. Except we don't do much but shoot off fireworks at night. So if they all want to come with me, great. If not, I'm fine with that too. So long as they remember I've got our only car on Sunday. Haha! I was going to tease you about not stopping for coffee in Saskatoon! next time! I'm hopeful that once the south bridge is done, Lorne Ave by the museum will be fixed too! hopefully!! Well, I'm still bummed that you missed the railway special day!! But David makes up for it. What an incredible trip Anita, and I'm so glad you are sharing it in pieces. what a blessing to be able to do this kind of research! And the photos are lovely as usual. So, Elaine - you caught my gaffe with Lorne St vice Ave, eh? LOL I couldn't remember and am multi-tasking as it is so didn't take the time to check. tsk tsk on me. I hadn't realized they're making a South bridge. I hope you're right. Thanks for coming back and sharing. I'm still moaning because y'all got to see Colonial Williamsburg - not once, but twice in the last couple years. Since I write in the latter part of the 19th century, perhaps it's just as well I got to see Fort Battleford instead. Anita, this is so great! I love research trips, too. They are awesome. I'm going to try and go to Williamsburg next year, so if you want to go just holler! 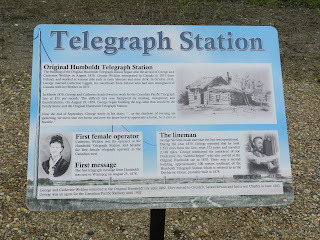 Thank you for linking to my post, and very cool about the telegraph operator. Oh! I meant to comment on the American Mountie - yes that's a funny twist! I love your research posts, Anita! So much fun. Great pictures. Thank you! 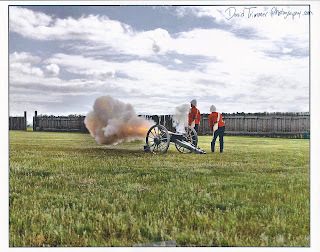 And speaking of research, no one commented on my Cannon Fire video. I wonder - is it too commonplace? It was only the 2nd time I've ever seen one fire so thought it was quite novel. Anita, it's not commonplace. I've only seen it once, when Kirk and I went on the tall ships (Lady Washington and Hawaiian Chieftain) and they had a "battle" in my cove. It was so cool! Oooh, I love the tall ships.